What do you think of when you think about Magic? It's probably attacking, blocking, creatures, removal spells, and some of the other hallmarks of a close, back-and-forth game. Well, Magic can take a variety of forms. Today, we're going to discuss decks that aren't interested in playing close, back-and-forth games. We're going to discuss linear strategies. We'll go over what they look like and some of their strengths and weaknesses. 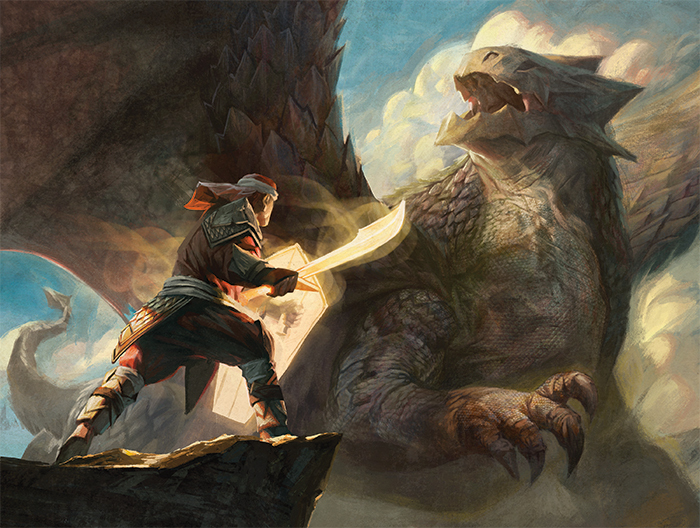 At the end I'll preview a Fate Reforged card that could be very valuable to at least one linear strategy in Standard. To employ a linear strategy means that you're entirely focused on one goal or theme. Every card contributes to that goal, and you have little interest in deviating from that plan. Worrying about what your opponent is doing is largely just a distraction. In short, linear strategies follow a "straight line" from point A to point B. In my days as a more casual player, I built a deck that employed a linear strategy. 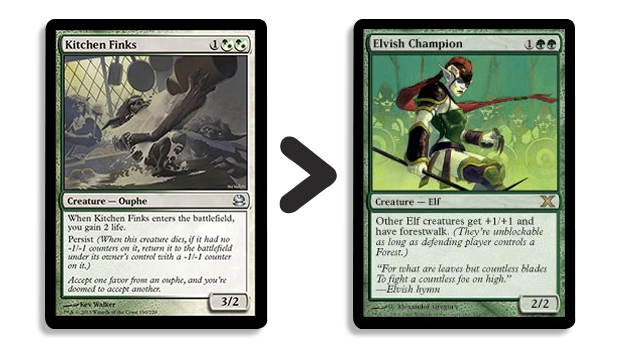 I saw the card Elvish Champion and thought, "Hmm, I like this card and I like elves." Nothing came of it until my interest was later piqued by Imperious Perfect. When Elvish Archdruid and Joraga Warcaller were printed, I knew exactly what I had to do. I built a deck with a lot of Elves and a lot of creatures that give bonuses to Elves. Genius, right!? Now, not all green creature decks fall under the umbrella of "linear strategies." You could even build a deck with Imperious Perfect and a lot of Elves without necessarily employing a linear strategy. However, in my deck I eventually reached a tipping point. I added so many cards that benefited me from playing with Elves that I no longer wanted any cards in my deck that weren't Elves. I didn't want to draw my Giant Growths anymore, I didn't want to Doom Blade my opponents' creatures, I just wanted to draw more and more and more Elves. I cut all of these miscellaneous cards and simply played with all lands and Elves. I had a linear strategy. Linear strategies have the potential to be extremely explosive and powerful. Their goal is not to play a fair game of Magic. They frequently succeed in that goal—running over opponents whose decks might be slower, might be less powerful, and certainly are less focused. In the time period that I was playing my Elf deck, one of the best creatures in the format was Kitchen Finks. One on one, Kitchen Finks greatly outclasses Elvish Champion. 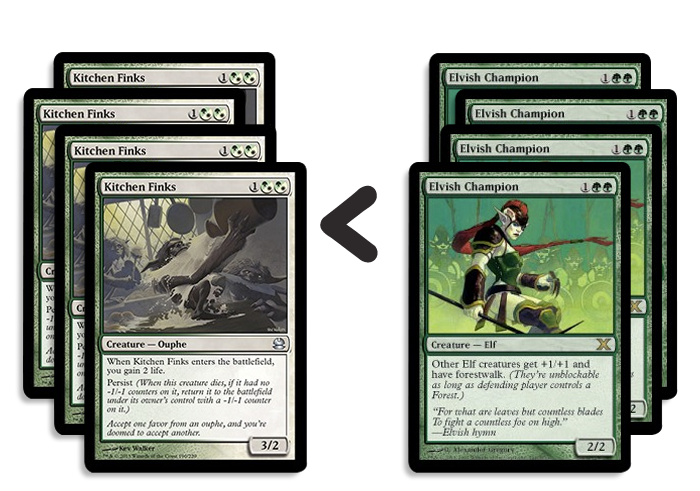 However, how do four Kitchen Finks match up against four Elvish Champions? What if I then spent five mana to add Joraga Warcaller to the party? Linear strategies are often designed to spiral out of control. If my linear deck is allowed to "do its thing," and your normal deck is allowed to "do its thing," the linear deck will come out on top—often in impressive fashion. Here's another linear strategy that we touched on once in this column. Combo decks are great examples of linear strategies. In Li Shi Tian's deck, you'll note a lack of combat-ready creatures and a lack of removal spells. Basically, there's a lack of anything that does anything! Anything, that is, other than contribute to his combo. A recap from the last time I featured this deck: "Lee Shi Tian's deck is built around Jeskai Ascendancy. In addition to a number of other powerful interactions, he would aim to assemble Jeskai Ascendancy, Retraction Helix, and Briber's Purse. He would cast Retraction Helix on a creature—say Rattleclaw Mystic—tap it to return Briber's Purse to his hand, cast Briber's Purse for zero mana, untap his Mystic with Jeskai Ascendancy, and repeat the process until his Rattleclaw Mystic had +1,000/+1,000 from Jeskai Ascendancy, then attack for the win." Li Shi Tian was able to assemble this combo with deadly effectiveness. He didn't need removal spells or defense of any kind because he was simply faster and more powerful than his opponents. He would win the game on turn four, and in many cases there was nothing his opponent could do about it. When everything is forced to contribute toward the linear strategy, the quality of a deck's individual cards can suffer. After all, I named Kitchen Finks as one of the best creatures, and yet the single-minded nature of my deck forced me to pass on the opportunity to play with it. When things were going well, I never missed Kitchen Finks, happy instead to have more Elves. However, when things were going poorly I sometimes regretted my choices. One on one, Kitchen Finks beats Elvish Champion. Four on four, Elvish Champions beat Kitchen Finks. So it becomes the normal deck's goal to keep things as close to a one-on-one fight as possible. It becomes the linear deck's goal to expand things out to make sure its cards are at their most powerful. We call this achieving critical mass. One way to combat linear strategies is to keep them from achieving critical mass. I liked playing against Kitchen Finks with my Elf deck. You know what I didn't like playing against? Lightning Bolt. Shock. Doom Blade. 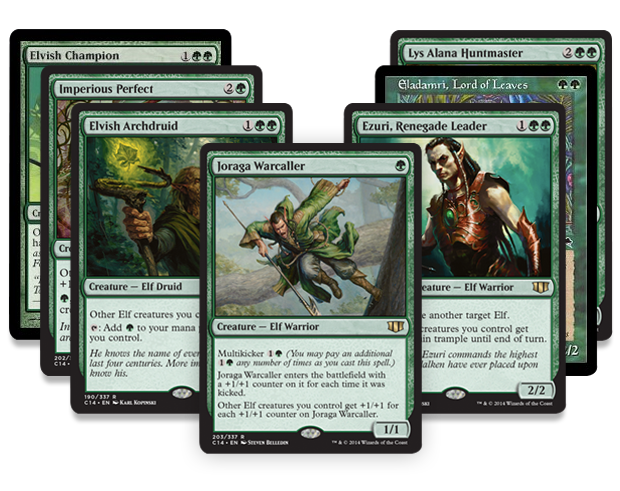 When my opponent was able to kill a lot of my guys and keep me with only one or two creatures on the battlefield, my Elves were simply weaker than whatever creatures the normal deck had chosen to play with. When I couldn't achieve critical mass, my deck didn't function the way I wanted it to. Linear strategies give up flexibility in exchange for power. Two additional weaknesses stem from this. First, linear strategies typically have very little ability to interact with their opponent. They're unprepared to shut down their opponent's game plan, instead banking on the fact that their own strategy will be more powerful. What happens when my Elf deck goes up against Jeskai Ascendancy combo? Well, I have no way to kill an opposing creature, no way to destroy an enchantment, and no way to make my opponent discard cards. These things are true because every non-Elf card that I could've added to the deck would weaken my strategy. Well, now my decisions have come back to haunt me because I'm up against a deck that's faster than my own, and I can't do anything to stop it. All I can do is play out some Elves and wait until my opponent kills me on turn four. I hardly get to play a game of Magic at all! Second, linear strategies are sometimes very easy to attack. When we discussed sideboarding, I said, "A rule of thumb is that the more extreme a strategy is, the easier it will be to sideboard against." Linear strategies are as extreme as it gets. My strategy is extreme and exploitable, so my opponent can easily sideboard cards that utterly devastate me. The problem is compounded because my lack of flexibility makes it hard to employ counter-measures or damage control. It's all a game of weighing pros and cons. Linear strategies can be attackable, and they can lack flexibility. However, often their raw power is worth making these sacrifices. If you're a very big favorite before sideboarding, maybe you're willing to accept being a small underdog after sideboarding. There's another linear strategy in standard that's been having success. White-Blue (WU) Heroic seeks to quickly and efficiently create a single, giant creature. This creature typically winds up being unblockable and sometimes gaining lifelink! The whole deck is designed to support and protect this one threat. As is typical of linear strategies, you'll notice no removal spells in Tom Ross's WU Heroic deck, except for one Singing Bell Strike that can be searched up in a pinch by Heliod's Pilgrim. To play with more removal than that would be a mistake, because every card that does not contribute to the primary game plan will only serve to weaken the deck. Remember, you're going from point A to point B, and you cannot afford to take detours. Valorous Stance is an exciting and versatile card from Fate Reforged that might wind up being a perfect addition to WU Heroic. Much of the WU Heroic deck must be dedicated to protecting its powerful creature. Otherwise, a single removal spell would be able to shut down the strategy completely. Valorous Stance protects a creature in a direct, reliable, and efficient way. It contributes directly to the WU Heroic strategy, doing a job that needs to be done. It also serves as a way to incorporate a removal spell, and in turn some much-needed flexibility into the deck. Again, WU Heroic cannot afford to play with Suspension Field, Reprisal, or any other dedicated removal spells because they do not contribute to the linear game plan. However, that doesn't mean that it never comes up that you wish you had a removal spell! 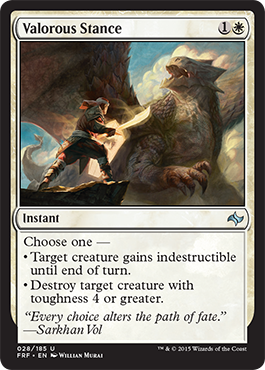 Valorous Stance takes out Courser of Kruphix, Siege Rhino, Butcher of the Horde, Savage Knuckleblade, and any of a dozen other hallmark creatures of standard! For WU Heroic, this can mean getting through an annoying blocker, swinging a race in your favor, or simply buying some extra time to enact your game plan. It's all possible because of the versatility of a card that can play two different roles. A removal spell alone would not make the cut, and Feat of Resistance might be preferable to the indestructible effect. However, putting both abilities together makes for a card that will be tremendously valuable in a large number of games. Valorous Stance is an excellent card, and need not be restricted just to WU Heroic. It could be a great addition to any white-based creature deck. It also has applications in combat. It can allow your Mantis Rider to beat your opponent's Mantis Rider in combat, for example. The addition of Valorous Stance to WU Heroic might make for a particularly deadly linear deck in Standard. Be the one to benefit from its power, or else be ready to dismantle the strategy with counter-measures of your own.